Globally, community-based child protection mechanisms (CBCPMs) are frontline efforts to protect children from exploitation, abuse, violence, and neglect and to promote children’s well-being. CBCPMs are defined broadly to include all groups or networks at grassroots level that respond to and prevent issues of child protection and vulnerable children. The aim of this note is to outline some ways of engaging with CBCPMs, especially within the education sector, which apply in both urban and rural protracted refugee settings. 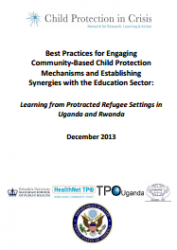 This note is based on the findings of two studies of CBCPMs and their linkages to the education sector in two protracted refugee settings: one conducted amongst urban refugee communities in Kampala, Uganda, and the other in two refugee camps in Rwanda.